If you need a slim fan than the Kaze Jyu SLIM could be just what you are looking for. 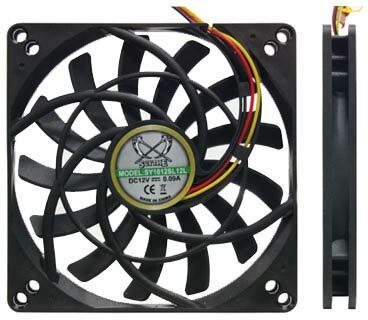 The fan is 100mm but it has 92mm fan screw holes so it could replace any existing 92mm fan. The fan is also supplied with a HDD mounting kit, allowing the fan to be mounted directly to any 3½" hard drive to aid cooling. Working fine for around 2 years in an ITX setup in a kitchen - the fan picked up a lot of dirt from the environment - until 6 weeks ago when I decommissioned the machine. Very quiet, I used it to replace a faulty fan on an Alpenföhn Panorama. When I can't afford Noctua I'm more than happy to go for Scythe. Required this to sit in front of 4 sata hard disks in my HP ProLiant server. Unfortunately there wasn't enough room to mount it on the cage that sits in front on the drives so I removed the cage, drilled 2 small holes in the case above the drives and mounted the fan with a cable tie at each corner - 2 in the holes above and 2 in the grill below. The drives were very hot to the touch before I fitted the fan but now they are cool to the touch. The fan is very quiet and there is a good airflow between the drives now. This fan just fits neatly behind the front case cover.